Fire fighters belong to a very special fraternity, and it is one that can be honored with unique and customized fire department challenge coins. Custom fire department coins are a great and tangible way that fire fighters can show pride in their department and their fellow brothers and sisters. Our coins have been used to honor a long list of heroic fire fighters, and nothing makes us happier than knowing that our hard work has been put to good use. 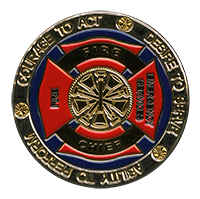 If you are interested in designing and ordering fire department challenge coins, simply e-mail our team and we will collect some information and furnish an accurate quote for you. This whole process is free of cost and without obligation.